The Situation Room Experience: The students started with the real life scenario of the 1981 attempted assassination attempt on President Reagan in 1981. Some students were part of the President’s Cabinet and were then put in the exact Situation Room that was used by 9 Presidents, other were with the President and were part of the Crisis Management Team at the hospital, and then we had 3 media teams – CNN, NBC, and CBS (these were teams of 4) they had to report Breaking News (with the facts), and cover the Deputy Press Secretary’s Press Conferences. The first picture shows the Secretary of State, Nick Thomas, addressing the press, and telling them why the 25th Amendment had been invoked. There is a picture of the Deputy Press Secretary, Helen Hayes, addressing the press during one of her press conferences, and the other pictures are of the media teams and their “Breaking News” segments (they had to do 2 different “Breaking News” segments that lasted 1 minute each. 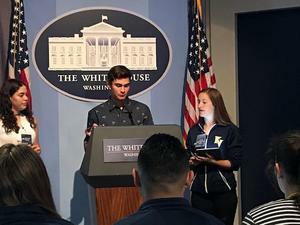 Things that came up during the Situation Room Experience (the actual “game” lasted 75 minutes and was very intense): Our Director of Homeland Security got a message on his tablet (each student had their own specific tablet) that there was a rumor that there was a car bomb in the area were Pres. Reagan was shot, so he decided to search every car within a 2 mile radius of that spot (in the debriefing they talked about the 4thamendment). Also, the economic adviser decided not to recommend closing down the stock market even though the Dow Jones was crashing – in the debriefing he said that he was in favor of the “free market” and that closing the Exchange would cause too much chaos. Also right after the President got shot, the Russia was threatening to invade the Ukraine – our Secretary of State decided to pursue diplomatic measures to get them to back down. These were just a few of the scenarios that the Kern Valley Honors Seniors had to work through during their 75 minute Situation Room Experience. After the experience, we ate lunch and then toured the museum. Mr. Meyers has some of those pictures. As we were leaving the Reagan Library, an elderly man approached me, and told me that he had been watching these students with the blue KV jackets (I had Wes check them out a school jacket) all day, and he said that throughout the day he was impressed with how well-mannered and polite they were. He said that they were a credit to the school and staff, and he shook my hand.